As you stand inside the synagogue at Beit Alpha, the first thing you should do, strange to say, is to look at the floor. There you’ll see a beautiful mosaic, full of pictures and scenes from the Bible, such as the sacrifice of Isaac. But the most impressive part of the mosaic is the large zodiac wheel with the names and pictures of the familiar twelve signs . We do not know the identity of the craftsmen who made the floor, nor of the patrons who commissioned it. We know nothing directly about the community which gathered in this synagogue. Indeed, had the mosaic not been uncovered by chance (by kibbutzniks who were digging a ditch for drainage pipes! ), we might never have known that there was a community here at all. What can be said about the community? From the writing in the synagogue referring to the Emperor Justinian, we can date the community to the beginning of the sixth century. 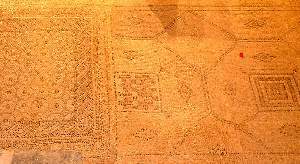 The floor itself indicates that the people who lived here must have been influenced by the culture of the society around them, for mosaic floors were common in Byzantine churches. No doubt the style was copied. But, a Zodiac? The Zodiac is not a Jewish symbol! The fact is that the Zodiac was imported to Palestine from Persia, together with much other astrological lore. Although condemned by the prophets, astrology made much headway among the Jews (as among other nations) during the first centuries of the common era . Even today we can still find echoes of astrological beliefs in Jewish culture; for example, the expression Mazal Tov which wishes good fortune or luck, contains the word ‘mazal which means an astrological sign. But just as they had done with Canaanite and Greek cultures before, the Jews did not just swallow the foreign Persian culture whole – they assimilated it and changed it. The signs of the Zodiac were given specifically Jewish meanings and associations: the lion became the royal lion of David, the twins became Cain and Abel, etc. Here we see the chameleon effect: the Jews often took on the cultural colors of their environment while retaining their essential Jewish identity. This enabled them to survive as Jews in a host of different environments, and to adapt to the times without sacrificing their essential Jewishness. And that’s what a Zodiac is doing in the middle of a nice Jewish floor. From the time of the Great Revolt against Rome (66 C.E. ), the Jewish community in Israel was forced to respond to a number of different crises. Each time, they managed to devise a means of survival. But the adoption of Christianity as the official religion of the Roman Empire found the community without an adequate response, and the Jewish community in Eretz Yisrael declined dramatically. But the community never disappeared completely. Small groups of Jews, clinging tenaciously to their land, kept their identity even while bending to the prevailing influences and absorbing much of the foreign culture which surrounded them. Beit Alpha and Peki’in, in different ways, point to this phenomenon. 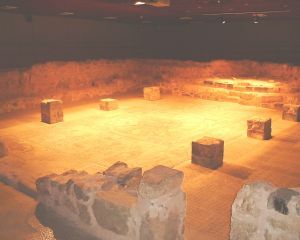 The Jews of Beit Alpha were influenced both by the building styles of the Christian church and by other cultural influences of the time such as astrol- ogy. Both of these influences can be detected in their synagogue. But the Jews took these influences and refashioned them in a way which reflected their identity as Jews. They were not overwhelmed by the surrounding culture. They assimilated it – it did not assimilate them. The Peki’in Jewish community held fiercely to their identity through the generations, but adjusted to their environment and were able to live as a minority in the surrounding culture. They might have surprised Jewish travelers by resembling Arabic-speaking peasants more than Jews, but they passed their traditions on from generation to generation. To them, the fact that they had stayed on their land, was an immense source of pride. A man who is exiled from Judea to the Galil; or from the Galil to Judea is not regarded as being in Exile. When is it called Exile? When he is exiled from Eretz Yisrael to other lands. If it had not been for the tenacious determination of Jews like those of Peki’in and Beit Alpha, the Jews’ link to Eretz Yisrael might have snapped completely.